Something Is Out There...: Where did they put the old house at Gretchen's Lock? Where did they put the old house at Gretchen's Lock? Every time I do the tour down at Gretchen's Lock, I mention that the old house was pushed into the old well that sat beside it. 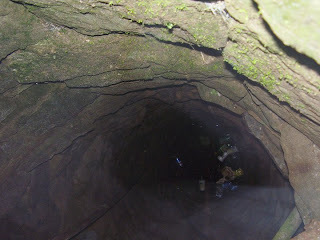 This is a picture of what the well looked like. A very large rock sat over top the opening, but you coiuld stick your camera in this little hole and take a picture, which I did.